Today I am going on the Lake Como Food Tours food tour of the Valtellina Wine Valley. We’ll be tasting cheeses at an authentic Italian bottega, doing a private wine tasting at two local wine producers, and having a lunch on the panoramic terrace of a 16th century house. Unlike Tuscany or Piedmont where the vineyards sit on sleepy hills, the Valtellina wine country dramatically climbs up the side of the mountain. It’s 8:30 AM in Varenna, one of Lake Como’s most charming villages. The day hasn’t even begun for most of the holiday makers here. Today I am going on the Lake Como Food Tours wine and chesse tour of the Valtellina Wine Valley . We’ll be tasting cheeses at an authentic Italian bottega, doing a private wine tasting at two local wine producers, and having a lunch on the panoramic terrace in a 16th century house. At the ferry stop in front of the Olivedo Hotel, a sparkling grey van with smoked windows is waiting. The driver, Alessio will accompany me and four other guests on a day of exclusive access to the Valtellina wine world. The Valtellina Valley is about 36 km (22 m) from Varenna. The drive takes us north towards Colico. The road is narrow and curvy and I am very thankful that an experienced local is doing the driving! The road hugs the shoreline and looks out to the vast open blue waters of Lake Como. After passing Fort Fuentes, the scenery transforms as we enter the valley. The blue lakeside scenery turns to a deep, rich green. Although we didn’t drive very far, you can already feel the mountain air and the rustic architecture tells us that we are in the Alps. The town of Morbegno is a small mountain village with medieval origins. Our first stop is Fratelli Ciapponi a historical bottega full of gourmet delights. The shop dates back to 1883 and has been in the same family for over 100 years! We are invited into the wine cellar, which descends three levels underground. You can feel the temperature drop going down the first flight of stairs. The thick walls dug into the mountain rock naturally insulate the cellar. Barrels and bottles of wines, massive wheels of cheese and dangling salami fill the nooks and crannies of the dim vault. After a lesson on wine storage and the process of cheese aging, we went upstairs for a cheese tasting. We tried Casera cheese; aged one year, two years and another that was matured for ten years. The ten-year cheese was firm and savory whereas the young cheese was mild and soft. 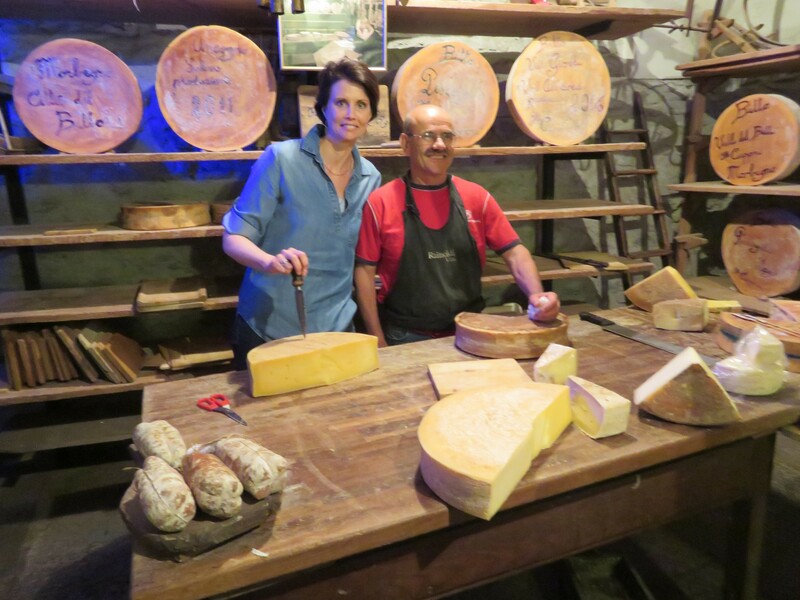 Insider tip: Morbegno Cantine Aperte, annual event where wine and cheese cellars all over town open to the public. Next stop is Balgera Winery, a small family run vineyard in the town of Chiuro. Brothers Matteo and Luca are learning the ropes, or shall I say “vines”, from their father Paolo. Matteo takes us for a tour of the grounds, the vats room and the cellar. We also had a preview of the new cellar they are building. We are welcomed into the salon of their 16th-century house where Matteo gives us an in-depth lesson on winemaking and the Valtellina terrain. We try the Valgella, Sasella, and Sforzato. We also get a little sample of their Valtellina Superiore along with Bresaola (cured beef), an aged Casera cheese and Scimudin, a soft cheese from the northern region. I not only went home with a bottle of Sasella, but I learned about the hard work that goes into producing a bottle of wine. It was lovely being welcomed into their home. Just a two-minute-drive from Chiuro, is the village of Ponte In Valtellina where we have lunch at Ristorante Cerere. We are served a Valtellinese lunch fit for a king. We start with Sciatt, beef bresaola and venison bresaola. A main dish of Pizzochieri, and of course, locally produced wine. During the appetizer, Alessio, our guide tells us, “Sciatt means toad.” Stunned, we all stop chewing. He laughs and says “No, it’s not really a toad! They just call them that because they are so ugly!” Sciatt is delicious battered and fried cheese. We blissfully eat our ice cream and homemade desserts overlooking the countryside, savoring every bite. Dotted along the hillside, Negri is prominently positioned and it is understandable how they are able to produce 857,000 bottles of wine per year. Throughout the years, they have won multiple commendations and awards and have brought Valtellina wine production to the international table of wine excellence. Upon arriving, a tour was just starting and we join a group of Americans, Swedes and Dutch. We visit the enormous grounds and cellar guided by Sara, who gives us a behind the scenes look of the Nino Negri winery. Massive barrels of up to 8,000 liters (2113 gallons) each sit side by side in a cellar that reaches a 30-meter depth. The wine tasting was set up on an antique wood farm table. We tried their Rosso di Valtellina, Le Tense, Inferno, Mazèr and Sfursat. All were outstanding, but my favorites were the Le Tense and Mazèr. The day was full and informative. The only thing I wish we had more time for was a few stops to take photos of the countryside. The landscape was extraordinary. Every morsel was delicious and learning about the wine and cheese making process opened my mind to a new appreciation of the foods we eat. Many thanks to Lake Como Food Tours who invited me to experience the Valtellina Wine Tasting tour.